Our immune system produces substances that combat germs. Once it has fought off a specific germ, the immune system remembers it and can fight it off should it return. Before there were vaccines, the only way to become immune to a disease was to get it and survive. Now, we have vaccinations that protect against illnesses including chicken pox, mumps, measles, whooping cough, rubella, hepatitis B, polio, etc. Vaccinations contain germs that have been weakened or killed. When they are given to a healthy person, the immune system reacts, and in turn, builds immunity. Throughout childhood and adolescents, it is important to stay on top of your child’s vaccinations. 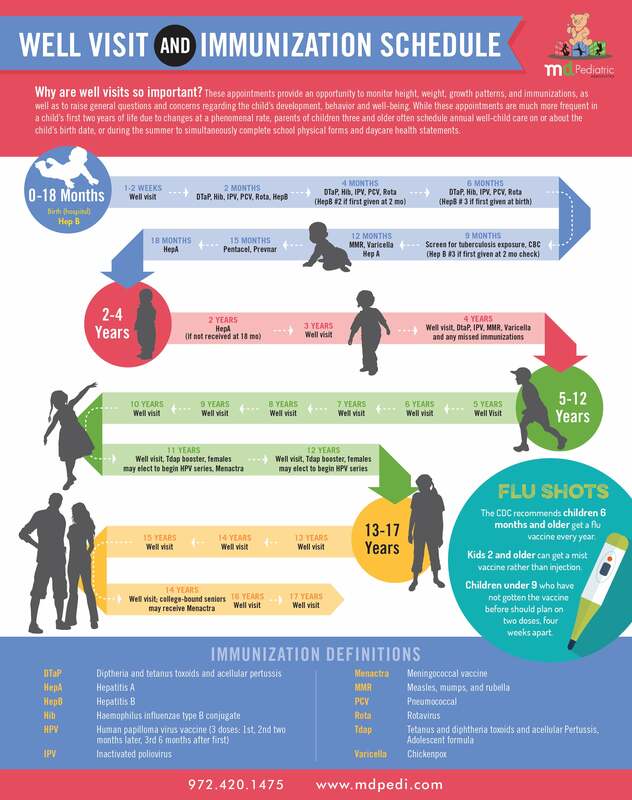 The American Association of Pediatrics developed a schedule for immunizations outlining when children should visit their doctor for a well visit. We have also created a fun and helpful infographic with the same schedule. A child’s most frequent visits will occur during the first two years of life. Then, for the most part, required once a year. To keep track of your child’s immunization records, the state of Texas has developed a convenient, free and secure online resource called the ImmTrac Registry. To register, you will download forms from the site, complete, then send to your health-care provider. Once set up, vaccination information will be sent directly to the registry after each appointment. At MD Pediatrics, we recommend fully immunizing children, based upon the most current and complete scientific data available which supports the development of immunizations as one of the most significant medical advancements of the 20th century. Because children who are unimmunized may pose a significant risk to some of the most vulnerable patients in our practice we will no longer accept any new patients to our practice who choose not to vaccinate. Our primary concern is the health of all of our patients and their families. Click here to read our full immunization policy.